I gave Sky an ultimatum last Winter. Sky was surprised, I don't give ultimatums and I'm usually pretty go-with-the-flow around here. I laid down the law, and told Sky..."a security system or a dog." (he's not a pet person, so I thought he would pick the security system, but he said "dog"). So now, we have Emma the wonder Labradoodle. She is practically perfect in every way, which I've said before, here on the blog. Let me shorten this and say that we had a series of getting up, checking the house, calming the labradoodle and coaxing her back to her bed. And then we'd do it all over again. Best way for a dog to freak its person? Stand in the middle of the house growling at nothing. Just stare. Look at the ceiling. Growl, stare. I don't believe in ghosts...but a chill ran up my spine! At 4 A.M. we went through this whole scene yet again, but this time she ran outside barking. So, I had to follow, because the neighbors are friendly and I want to keep it that way. I expected to find an opossum on the fence, but...nothing. Then I saw it, a ghostly white opossum face looking down from the patio. Mystery solved. He was probably walking on our roof the last hour. Meany marsupial. I said security system or dog. 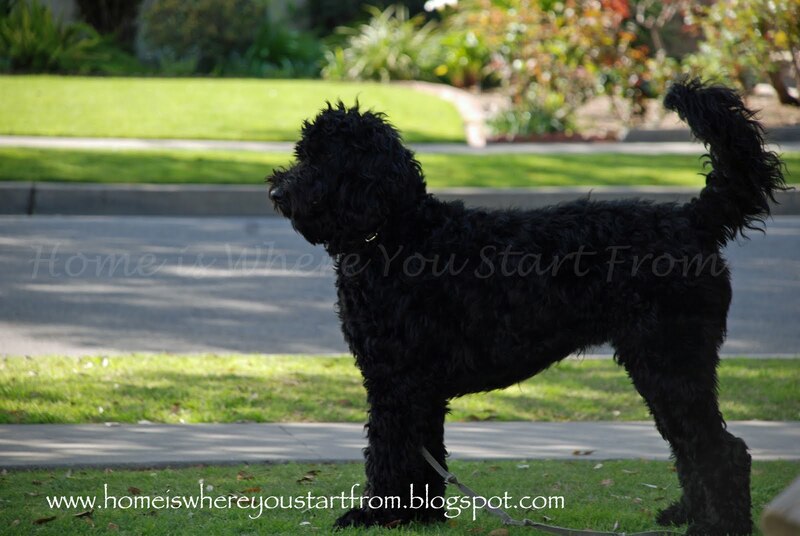 I got Emma the wonder-labradoodle: *Head of house security. *see Hank the Cowdog for this reference!